Bamboo and the island lifestyle have always seemed a perfect fit. In Hawaii's climate, bamboo flooring, furniture and fences are common sights. Bamboo holds the promise of a sustainable, cost effective, and ecologically benign alternative to the widespread global deforestation of temperate and tropical forests. In addition, designing with bamboo gives both the pleasure of working with sustainable materials as well as a natural beauty and grace. However, being able to explore the potential of bamboo as a building material, as commonly used throughout Asia, has not been accepted in the Hawaii due to building permit restrictions and lack of data and applied research. 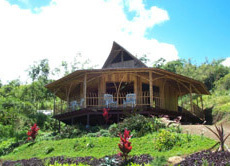 This is changing thanks to studies being conducted by the International Bamboo Foundation and the recent news that Maui county granted dwelling permits for all of Bamboo Technologies model homes. On February 6, 2003 Bamboo Technologies was granted dwelling permits for all of its model homes by the Maui County building department. application to the building department. There will be no need to go through a lengthy and costly code of appeals process. Bamboo Technologies says that dwelling permits for the other Hawaiian Islands will soon be accepted as each island building department is anticipated to follow the lead of Maui County. bamboo an accepted building material in the USA and international markets. Currently Stage 2 of the 3 Stage testing process is well underway. Stage 1 involved the collecting of bamboo test poles in Vietnam, the structural testing and insect damage testing at Washington State University and the University of Hawaii, and the writing of a report summarizing the testing that was presented to the ICBO. Stage 2 involves the Joint Testing of bamboo connections; The development of a Quality Assurance Manual and an inspector in Vietnam to ensure the consistent quality harvesting and processing of bamboo poles; Fire Resistance testing of bamboo poles (completed); and Insect Damage testing.With the public becoming more sensitive to degradation of the rain forest in third world countries and the diminishing forest reserve in our own country, there is more interest in experimenting with bamboo as a wood substitute. There is also effort underway to have the Uniform Building Code modified to include bamboo structural components. This could eventually lead to acceptance in some form of bamboo in the "round" and "engineered" bamboo structural components in the rapidly expanding use of "engineered" lumber.